Dorothy Perkins seem to permanently have a sale on at the moment (and even when they don’t, there’s almost always a discount code floating around somewhere, making them a great place to pick up a bargain! 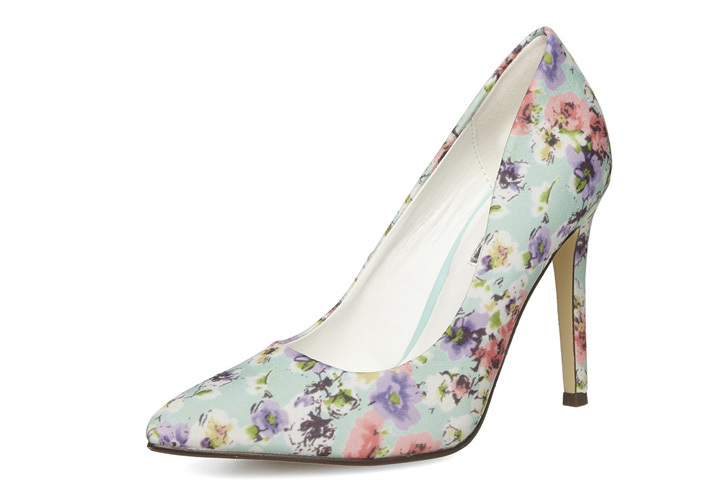 ), and because of that, these shoes are currently just £22. Also because of that, however, they’re NOT currently available in all sizes, so if yours is sold out, and you’ve fallen in love with them, you may need to check in-store – sorry! If you do manage to find your size, however, I think these could be a great little budget buy for spring: the colours and print are just so pretty, and I think these would look so cute with something like jeans and a pastel coloured sweater: causal, but still a bit special. Mint green is one of my favourite colours, but on its own, it can actually be quite hard to style on a shoe, because it’s very light – the floral print on these should help with that, though! 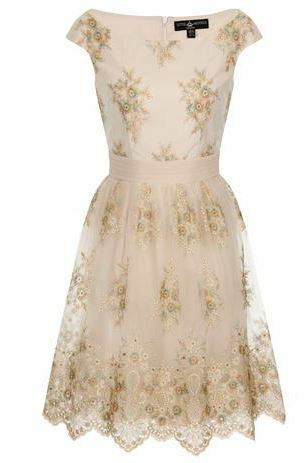 For my dress selection today, I’ve gone for this cream lace dress by Little Mistress. This is, again, shorter than I’d wear personally (I think my beloved midi dresses are starting to go out of fashion again – so many of the dresses I’ve spotted lately have turned out to be incredibly short, which is disappointing for me, but probably a relief for those of you who prefer your hemlines above the knee rather than below it! ), but I really love the delicate lace fabric, and the neutral colour will allow you to wear almost any colour of shoes with it, too: I’d probably go for gold, to pick up the colour of the embroidery, but it’ll work with lots of other options, too!